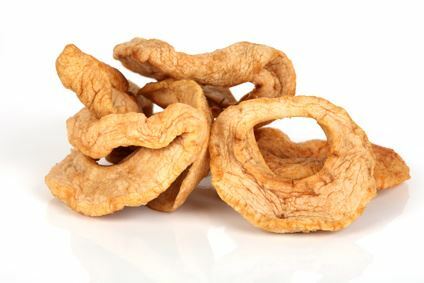 Dried apple rings are an exceptionally tasty snack between meals. Their fruity flavour make them a healthy alternative to sweets- Cut into small pieces they are a great supplement for muesli or desserts. Apples contain important vitamins such a provitamin A, the vitamins B1, B2, B6, E, and C, niacin and folic acid. Dried gently at low temperature, vitamins and aromas can mostly be retained in our apple rings.